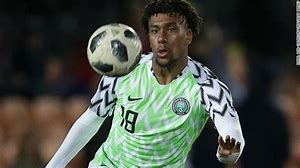 Super Eagles and Arsenal forward, Alex Iwobi has retained his ranking as Nigeria's most valuable player across the top five leagues in Europe. According to new figures published by CIES Football Observatory, the Arsenal winger's transfer value now stands at 63.7 million euros, an increase of €8.5 million. Iwobi's transfer value is €8.5 million more than Leicester City midfielder Wilfred Ndidi who is in second place and had a value of €55.0 million last month. With an estimated transfer value of €20.3 million, Kelechi Iheanacho sits third in the Nigeria rankings but saw his value drop by €0.9 million. Watford striker Isaac Success (€15.1m) and Bordeaux winger Samuel Kalu (€11.0m) complete the top five. Of the fifteen Nigeria players ranked, five represent Premier League clubs, four play in La Liga, three are in the Italian Serie A, two in the Bundesliga and one in Ligue 1.